Notify any change in arrival dates with 2 weeks notice. Has been serving world travellers since 1991. The perfect place to begin your adventure. Share with travellers from different countries while enjoying breakfast or planning your day. 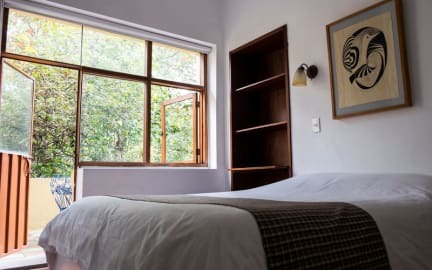 Located in the most beautiful and quiet street of La Mariscal, which is the heart of Quito’s tourist district for the independent traveller. – PLAZA FOCH: 3 blocks distance. – OLD TOWN: 40 minutes walking distance. – Close to all major transport lines. 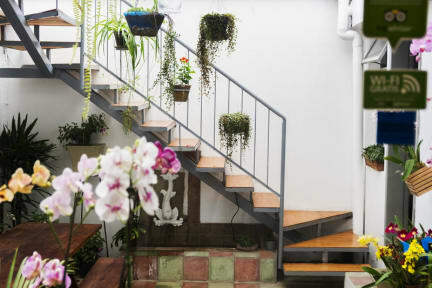 The hostel is made up of two houses designed to give you the best comfortable rooms and big communal areas which include patios, terraces, 2 living rooms with cable TV and fireplace. Free Wi-Fi in the entire hostel. Fully-equipped kitchen and self-service cafeteria. Please note that taxes are not included. Situated in the best street of the turistycal district of Quito. -Not just a hostel, but your home. -Great showers and permanent hot water. - Transfer from and to the airport. - Frendly and kind staff. Very clean hostel with a great staff! Good stay! Nice breakfast and staff - only stayed one night. On value for money, one must consider it's Quito, not Tena. When I discovered that "La Zona" nearby was party central for Quito, I was a bit dismayed, but in the hostel, every night it got quiet elevenish, and I slept well. As needed, I was able to walk to all 3 north-south BRT's (bus rapid transit), with Ecovia stops less than five minutes away. They have an office in front so if they recognize you, they'll buzz you in, otherwise, use your key. Coffee's great! A small breakfast is included. Located in a good neighborhood, close to the Plaza Fochi, which is a very popular place full of bars and restaurants. I felt safe walking in the neighborhood. Staff is gentle and the room was good. Amazing place in a quite street. Only couple of minutes walk to the Foch and about 40min walk to the old town. Staff was really friendly and our room was very clean. Good breakfast and close to Mariscal district and bus line but not Old Town. No lockers in dorms and a fairly quiet place to stay. Very clean and a laundromat just around the corner. Very helpful and cheerful staff.